Business of Producing is a broad look at all of the structures and pathways within the business side of the entertainment sector. It is a Monday night 3-hour seminar with industry professionals at the top of their game. Truly inspiring and fascinating! It is offered by the College of Fine Arts. It is available as an Undergraduate Course or Graduate Course as well as open to auditors who are interested in the Entertainment Sector. Please contact your academic advisor if you would like to discuss how this might fit into your degree plan. You must receive approval in order to count a non-business graduate course toward your MPA degree. 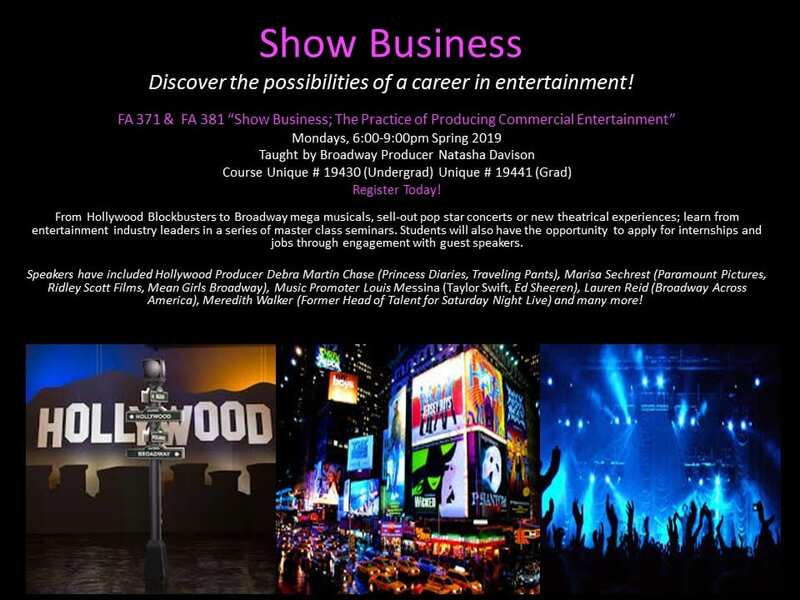 This course will focus on the world of commercial entertainment. We will explore all aspects involved in producing live stage and onscreen commercial productions. Inspiration (the search for creative content; self-generated or existing), to Organization (Executive, Administrative, Financial, Creative, Legal), Capitalization (Institutional, Independent, Theatrical, Key elements of “The Pitch”), Negotiation of Agreements & Contracts (Owner of Creative Content, Book/Script Writer, Composer, Lyricist, Director, Choreographer, Designers, Actors, Agents, Musicians, Unions, Theatre Owner, Merchandise, Investors, Insurance), and Execution (Rehearsal, Press, Marketing, Tickets Sales Structure). Students will engage with entertainment industry guest speakers at every single class meeting, examine case studies, and execute an independent group project/presentation for industry professionals as the final exam. Guest speakers coming in this Spring include Head of Paramount Pictures Live Theatrical Entertainment, Head of Ridley Scott Projects, Former Head of Talent Saturday Night Live, Producer of Tina Fey’s Mean Girls and Sara Bareilles’s Waitress on Broadway, Executive Producer of Les Miserables Film (with Hugh Jackman, Anne Hathaway and Russell Crowe), Creative Rep. for Hulu’s The Looming Tower, Head of Broadway Across America, Louis Messina (Concert Promoter for Taylor Swift, George Strait, Ed Shereen, Blake Shelton, Eric Church and many more.